Patients who have suffered harm as the result of negligent care from their medical care provider may be able to file a Georgia medical malpractice lawsuit against the person or organization responsible for their care. These Georgia medical malpractice claims can result in compensatory and punitive damages awarded to the patient, if the court finds that the person or organization was medically negligent in the care provided. Send your Georgia Medical Malpractice claim to a lawyer who will review your claim at NO COST or obligation. Georgia medical malpractice claims include allegations of medical negligence against health care professionals or facilities that have breached a reasonable standard of care to their patients. Medical malpractice claims must prove that a healthcare provider/patient relationship existed, that the healthcare provider was negligent in the standard of care provided, that the negligence caused an injury and the injury caused damages to the patient. Patients who believe they have a medical malpractice claim must be aware that there is a difference between being a victim of negligence and experiencing an unfortunate medical outcome. Not all surgeries that have complications are the result of medical negligence, for example. 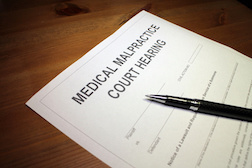 Under Georgia medical malpractice laws, plaintiffs have two years from the date of injury or death to file a lawsuit against the medical professional. Georgia has a statute of repose, which requires patients to file their lawsuit within five years after the act that caused the injury occurred, regardless of whether the patient knew about the negligent act at the time it occurred. In other words, if a doctor fails the standard of care but the patient doesn't suffer injury for more than five years after the act, the patient may not be able to file a lawsuit. Georgia used to cap non-economic damages—such as pain and suffering, mental anguish, and so on—at $350,000 against any single health care provider or facility and $700,000 for multiple health care facilities. Any one single medical malpractice case has a $1.05 million cap on non-economic damages. This law, however, was ruled unconstitutional by Georgia's Supreme Court in 2010. In 2014, a Georgia jury awarded $8.4 million to the family of an infant—Jakob Medley—who suffered hypoxic ischemic brain injury at birth. According to reports, the infant was born November 15, 2008, with low APGAR scores and metabolic acidosis but was not intubated for 8 minutes. Ultimately, the infant was diagnosed with cerebral palsy and at five years old was unable to walk or talk and required a feeding tube.